Matrix Parent Network and Resource Center is a parent-founded, parent-operated nonprofit organization founded in 1983. Click here for more about our history. Matrix provides both direct services to families and support services to other federally funded parent centers. Why is parent-operated important? 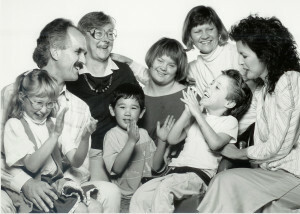 More than 50% of our Board of Directors are parents of children with diverse abilities and needs. Additionally, most of the staff at Matrix have children with special needs, so they have a deep understanding of what families are experiencing. All of our services are free, supported through grants, contracts, donations, and fundraising activities. Click here to learn more about how to help us serve families in our community. Click here to learn more about the programs supported by these funding sources. Matrix also serves as the Regional Parent Technical Assistance Center (RPTAC) for Region 6, providing technical assistance to Parent Centers in eight western states and territories to ensure they have the information and training needed to provide quality services to families in their areas.